There was a phase last year when I was unable to cook. We outsourced to a local bengali caterer and between him and D managed to feed the family okay. This guy however was pretty monotonous with his menu, he had some 4-5 items which he would repeat over the weeks and after a month you would think that alu-posto, dhokar dalna and charchari were all there is to a bengali menu. To satisfy my cravings for authentic vegetarian bangla food a friend came to the rescue and would send over a little of whatever she cooked each week. 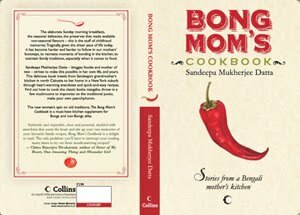 Now she is a damn good cook and has a vast repertoire of Bengali recipes, she also likes to cook and eat well and prepares a full 6 course meal for dinner almost every day. No doubt that food from her kitchen was much awaited while the caterer's supplies languished in the refrigerator. 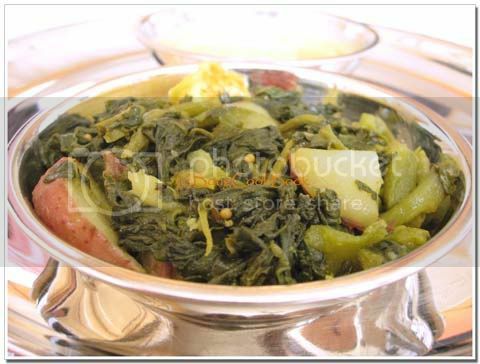 She used to make this Pui Chingri (Pohi Greens with Shrimp) which I fell in love with. I am sure my Ma would make it the same way but I was a typical kid regarding food choices and so though my Ma would force greens down my throat I don't have fond memories of them. 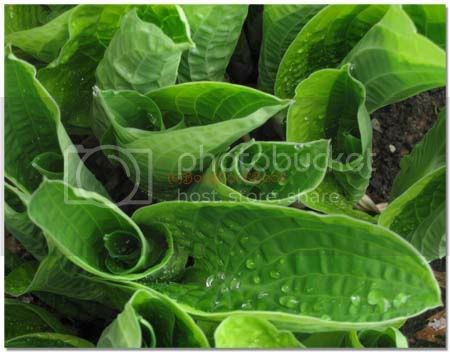 Now with age I am not scared of my greens any more and even the slimy Pui has joined my list of favorites. I have also learned greens don't make you stronger, it takes much more to grow into a person of character and strength, the 5 serving of vegetables merely sustains you in that journey. Which alarmed that Young Lady of Greenwich." 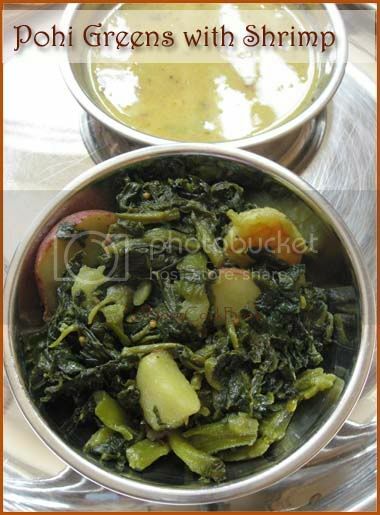 Pui Shaak or Pohi Saag has the scientific name of basella alba and some other fancy names like Climbing Spinach, Malabar Spinach etc. 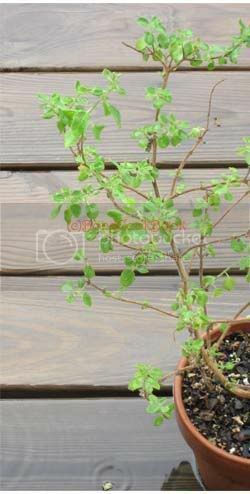 Basella alba is a fast-growing, soft-stemmed vine, reaching 10 m in length. 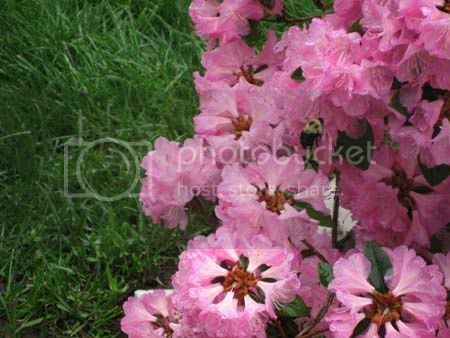 Its thick, semi-succulent, heart-shaped leaves have a mild flavour and mucilaginous texture. Wash and clean the pohi greens(I had about 1lb) and chop in small pieces. Chop the stems too. You can cover and cook to make it cook faster, but frequently remove the cover and give a good stir. The greens will release a lot of water which you want to dry up. Slimy pohi doesn't taste good. Till the age of sixteen I didn't know that Ilish(Hilsa) could taste so good in a simple light jhol (a soupy gravy) like this. 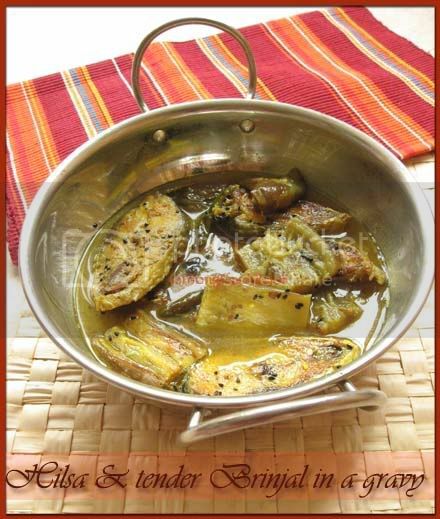 My Ma never made this particular preparation of Ilish, it was always ilish bhaja(fried Hilsa), ilish bhaape (steamed Hilsa) or shorshe ilish ( Hilsa in mustard sauce) at our home during monsoon, the Ilish season back home. Years ago it was the day of Saraswati Pujo. In our home(as in most Ghoti bengali homes) this was not only a vegetarian day but a day on which you ate Khichuri, bhaja, chaatni & such. I was a teenager who didn't like her khichuri and that too one served even without a omlette. The day didn't hold much of a prospect for me until my friend called and invited me over to their home for Lunch. I wasn't too enthusiastic about the food thinking it would be the same fare but the lure of her latest Sidney Sheldon was there and so I went. "But Bangals have a tradition of eating Ilish on Saraswati Pujo, we absolutely must and if it is Jora Ilish(a hilsa pair) all the better", said the friend's Mom. Wow, Bangals (Bengalis originally from East Bengal who later migrated to India or West Bengal. East Bengal is now part of Bangladesh) are such intelligent people, must marry one of that species, I thought. And then I saw Ilish with all that begun (eggplant), a Ilish Begun er jhol (Hilsa in a light gravy with eggplant) they told me. 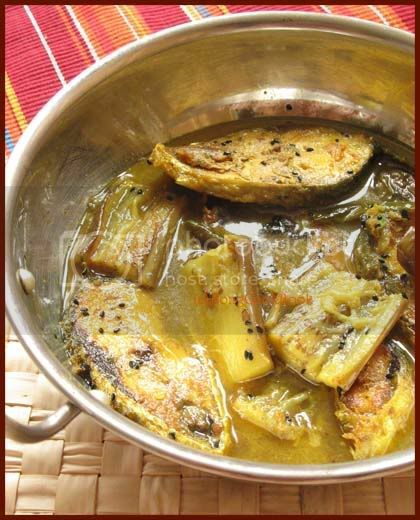 I was skeptical, Ilish being one fish that is not cooked with vegetables in our home and then I took my first mouthful.The simplicity of the curry bursting with flavor of soft brinjal, the taste of the Hilsa and the mustard oil was too much for me. It was absolutely delicious, it shifted Ilish's position from a special fish you would respect to a homely fish you could love. I have been in love with this dish ever since. My in-laws being Bangal make this exactly the same way and now when I get Ilish I make this before venturing into ilish bhapa(steamed hilsa), shorshe ilish(mustard hilsa) and others. This is served with white rice for a homely meal and has no trappings to make it famous except the fresh light taste. Heat Mustard Oil to smoking in a Kadhai. Fry the fish pieces to a light golden yellow on both sides. Try not to brown or burn them. Remove with a slotted spoon and drain them on a kitchen towel. Once the spice pops add 1 long japanese eggplant washed & chopped longitudinally in length of 1&1/2" to 2"
Saute the eggplant till they are lightly browned and soft. The gravy will be light and soupy and tastes delicious with white rice. Ok so I finally baked a cake succesfully. My baking attempts have always been a flop show even with the simplest of the cakes. So I always stick with a Betty Crocker mix or a Bisquik and try to end the story there. I guess I am not good at sticking to instructions and my mind wanders off just where the recipe says sift flour and baking soda together. Improvising where baking is concerned is a strict no-no and I have learned it the hard way. This time I was determined to make it work though and I chose a simple recipe from Sunita. Something that did not ask for any new fangled ingredients hitherto unknown to me, something that could be achieved with what I had at home and something that did not ask me to beat eggs and such for 5 whole minutes. 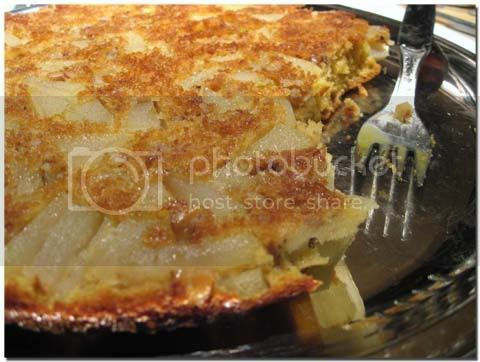 So Pear-Walnut Cake it was made with atta. But trust to me goof up even with the simplest of all recipes. After following all her instructions I preheated the oven to 180, did you read it right,1 - 8- 0. Isn't that way too less, I told myself, maybe I should increase the temp. But then I had decided to stick, blindly stick with the recipe so with all my doubts I heated the oven to 180. And then I followed what the recipe said exactly. When the timer went "Ping" all excited I took out the bake tray to see nothing had turned "golden brown" and the batter was the same gooyey mess it was half an hour earlier. And then my brain which had hit the dead end, 'coz it was 12:00 at night by then did a jolt and it struck me that Sunita was in the UK and so her recipe said 180 C, see the C, not F but C in capitals. I was in goddamn North America where they didn't believe in C (Celsius) and had F (Fahrenheit) !!! So after all the math conversions we finally raised the oven temp to 350 F and the cake turned golden brown and delicious after a glorious 17 minutes. 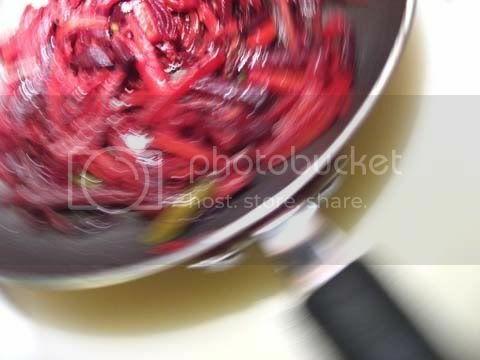 Cabbage Fry -- This was M Didi (baby A's nanny) contribution. I finally asked her to cook one or two dishes for me each week. Masoor Dal & Toor Dal with Dill -- Regular masoor dal. The toor dal with dill was a new flavor. Haven't tried dill too much and this was the first time had it in a dal. Reminded me of one of the paying guest Aunty in B'lore, this was the unknown taste I always found in her dals. So these were my Mothers Day Gifts. Mission accomplished. But the "cheapo" that I am, I plan to trade half of the Pier 1 gift card for a HomeGoods one, that will get me a lot more with the same amount. I know, I know its the sentiment that counts and not the gift and I do apply that principle for all others except the parent and D. You see if someone close like my family is giving me an expensive present, I would rather see the money well spent. With others I am polite. But sometimes the gift giving especially for Kid's birthdays goes a bit out of hand, both ways when you are the giver or the receiver. While giving the budget seems to constantly increase with the years and with Big Sis S's class of 15 kids, having a birthday party almost every month sure puts a strain on the purse strings. The receiving scene is not too happy either with lots of gifts which the kiddo exactly doesn't need, given that she is not the kind who plays extensively with toys. Really what do you do with a gift especially kid's toys(which just grows and grows) that you don't think your kid will play with at all ? I could be like my Mom who wrapped up the nth La Opala coffee mugs that I got for my wedding and gifted it to neighbor 2's niece's sister-in-law on her marriage. The relations were far flung and the gift was sure to submerge in a deluge of more such coffee cups. Or I could be like this friend who presented us with a pretty gift with words as to why she thought this would be perfect for us. Later when we took out the gift from the box, tucked in its warmth was a card blessing a certain bride and groom on their marriage.Given that neither us nor the friend were recent new brides, I can only say the gift had a long lineage. Truth be told I have done that at times but with a close network of friends it is a dangerous thing to do and so the gifts keep piling up in the basement. With the kid's toys I don't want to do it because I feel people do spend time and money and some thought buying them so you can't just give them away. Seriously tell me what do you do ? Do you donate, recycle gifts, do what ? Since S has declared her love for paneer, we get a block for her almost every other week. We ate paneer in moderation before, maybe once in two weeks and that was it. 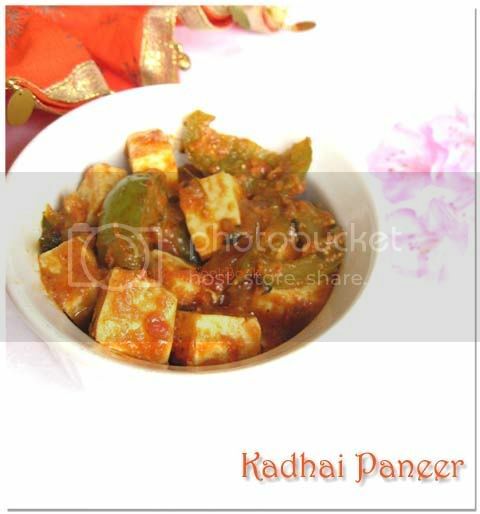 Now with the deluge of paneer I thought of trying a Kadhai Paneer. I am not too fond of bell pepper with chicken or fish and Kadhai paneer is not exactly my favorite item on the menu. But this might be a good way to get those anti-oxidant loaded bell peppers into Big Sis S I thought. 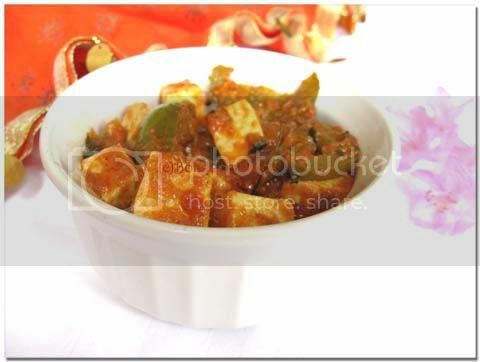 So Kadhai Paneer it was and I followed the recipe from Fun'n'Food this time with certain changes to my taste. It is a very simple recipe with little time needed and simple ingredients. It tasted pretty good and looked pretty too. Prep: Cut almost 12 oz of Paneer in small cubes. There were about 2 cups of paneer cubes. I made Ghee, at home, with my own hands. No I didn't milk the cow or anything and I used a shortcut, but if we put that aside, I made Ghee in bold letters. With that I graduate from a regular Mom to the ubiquitous Aunty-ji. Pleez do consult me with all your gharelu(household) problems including mom-in-law , husband , bai and water shortage, and of course how to make ghee. That I can't make decent phulkas shall not be discussed in this post. In a heavy bottomed pot/vessel/pan place 4 sticks of organic unsalted butter. At medium heat let the butter melt. There will be foaming and bubbling while the butter melts but soon this will subside. Reduce heat to low and simmer uncovered. Stir intermittently. Gradually you will see milk-solids turning from beige to brown and settling down at the bottom while a clear transparent golden liquid remains at top. Once the milk solids turn a deep shade of brown turn off the heat. Note: The point at which you turn off the heat is critical, too little or too much is not desired. Keep watch and don't burn the milk-solid. Also keep the heat at low and don't try to hasten the process by turning heat to high. Do not disturb the vessel/pot/pan and let the milk solids settle down at the bottom while only the clear liquid remains at the top. The golden liquid that you just collected is precious ghee. Smell. Heaven. 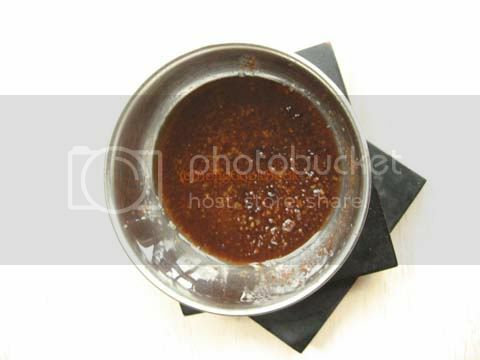 Now we Bengalis do not throw away anything that is edible and the deep brown milk solids that remain at the end of the ghee making process are a delicacy for us. We call it cha(n)chi (ch as in chair and then a nasal sound for n) and eat it mixed with plain white rice, salt and mashed potatoes. Strangely while I do remember the smell of ghee from my childhood, more than the ghee I remember this rich brown "leftover" granules which we used to savor mixed with white rice. So while the home was fragrant with the smell of ghee we enjoyed a rare dinner of rice, alu sheddo with finely chopped onions and green chillies and dollops of ghee & cha(n)chi. To make alu sheddo(siddho), boil potatoes skin on till done. Hold under running water and peel the potato. Mash with back of a spatula. 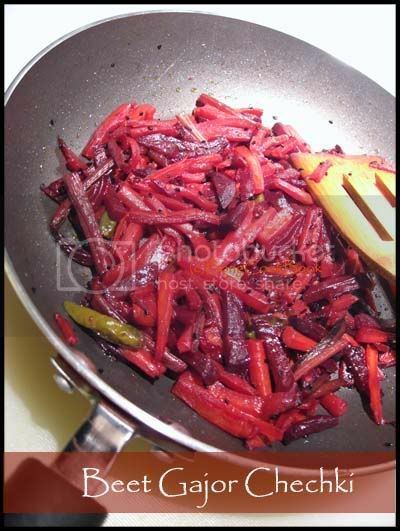 Add little mustard oil, finely chopped red onion, finely chopped green chilli and salt. Now with clean hands work all of this in the potato and make smooth rounds of mashed potato. Enjoy this with white rice and dollops of golden ghee. 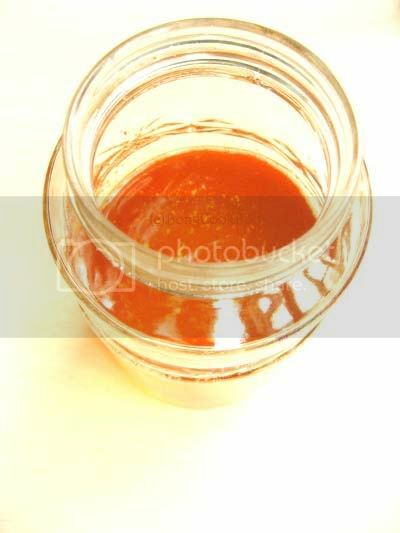 According to Ayurveda, Ghee builds the aura, makes all the organs soft, builds up the internal juices of the body-Rasa, which are destroyed by aging and increases the most refined element of digestion-Shukra or Ojas, the underlying basis of all immunity and the “essence of all bodily tissues”. 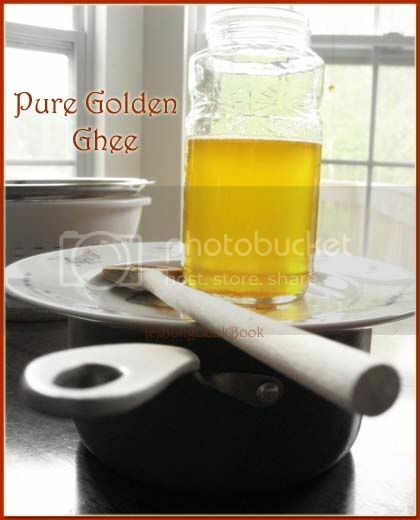 Ghee is known to increase intelligence--Dhi, refine the intellect-Buddhi and improve the memory-Smrti. A little bit of ghee added to your food boosts the flavor and if that ghee is home made the taste triples. So like me if you do not use ghee as a cooking medium, occasionally add half a tsp of ghee just before finishing off your cooking and savor the goodness of ghee. Dry Roast 20 Green Cardamom/Elaichi, 10 Clove/Laung, a 2" stick of cinnamon, 3-4 Dry Red Chilli for the slightest heat, 2-3 small barks of mace/javetri and a small Tej-Patta. Note: What I have here is a Bay Leaf but a small Tej Patta(Indian Bay Leaf) works better. Also you can substitute red chili with black peppercorns. You can dry roast either on the stove top or pop them in the oven at 250F for 5-8 minutes. The roasting is done only to warm the spices which have been lying around for a while. Instead you can sun them and then grind. Grind to a fine powder in your coffee grinder. Lately I have been a sucker for home made spices. I cleared the pantry of all Shan masalas and barring the Kitchen King, Kasoori Methi and Amchoor I have no other store bought spice powder. Oh, wait I have a packet of Deggi Mirch which is used sparingly by us and and indulged on by the nanny. So anyway without all the Shaan masala I was kind of stranded in no-spice land when I wanted to make a Kofta Pualo some time back. Luckily I remembered the Biryani Masala at Mallugirl's. 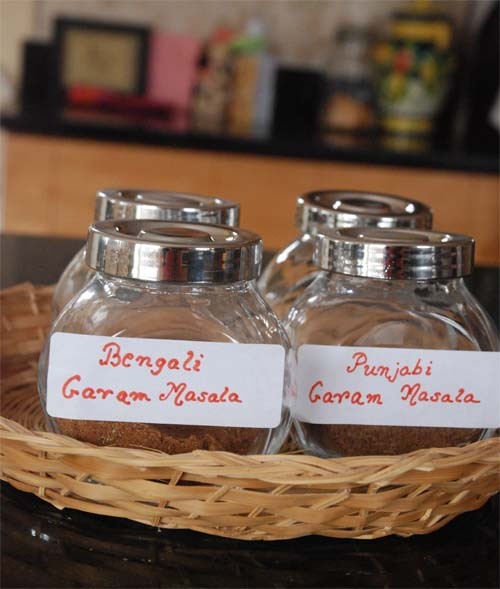 I love that masala and use it for not only making Biryanis but in various other dishes. 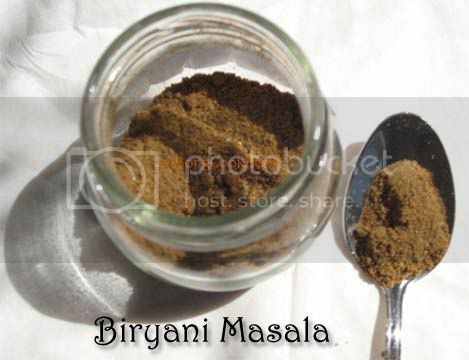 Here is how I make Biryani Masala based on this recipe. I reduce the carraways seeds and increase the fennel as I like the sweetness of fennel and find cararway seeds too spicy. Also I forgo the star anise and add nutmeg powder instead of the whole. 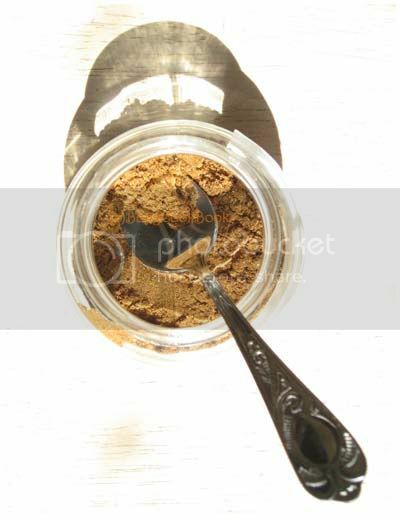 Use this masala for loads of stuff from adding a pinch to your pualo to spicing up the marinade for fish, from adding to biryani to your chicken curry. 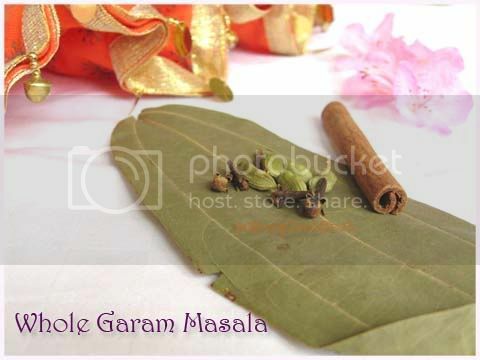 I use this masala alternately with Garam Masala but when using this, use a smaller quantity. And then there is the Bhaja Mashla(Roasted Masala) my Ma makes for sprinkling over most chutneys and also in vegetable chops. I had blogged about it here in my Baked Beet Roll recipe. The Bhaja Masala is called so because the spices here are dry roasted and then ground. 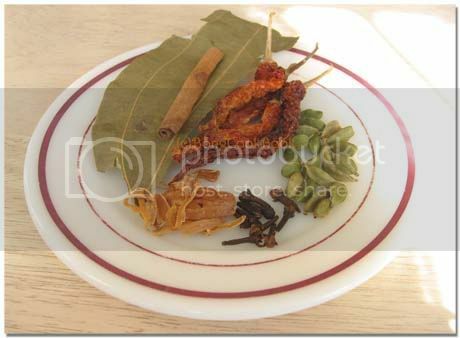 This spice mix has been blogged about in detail in my later post Bhaja Masla. I did it this way. To make this sun or gently warm on tawa 1 tbsp Cumin seeds, 1/2 tbsp Clove, 1/2 tbsp Peppercorn, a 1" stick of cinnamon, 1 tejpatta and around 15 black cardamom. Dry grind to a powder. This weekend our kitchen floor is getting a makeover and so the kitchen will be closed for weekend. I am shacking up at a friend's place, kids in tow and the friend has promised to make a Patha'r Mangsho'r jhol for lunch tomorrow. She cooks delicious food and you know what I am looking forward to. Wishing all Moms a Very Happy Mothers Day. 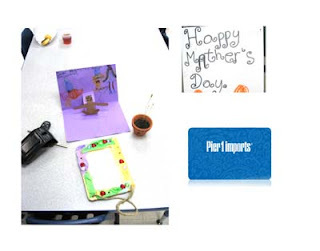 There is a Mother Day event going on at Desi Momz Club. All moms, member or not please feel free to contribute. 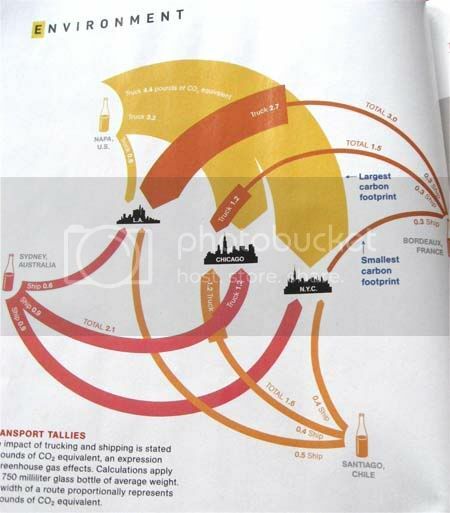 There was an interesting article in NatGeo(May '09) about the carbon foot print of wine. It seems it is more carbon efficient for a New Yorker to raise a glass of French Wine than a California one. The wine journey from Napa Valley, Calif by less efficient and more carbon emitting trucks has a larger carbon foot print than the wine container shipped from France or even Sydney. So even though "distance" does matter, efficiencies in transportation might overcome that. 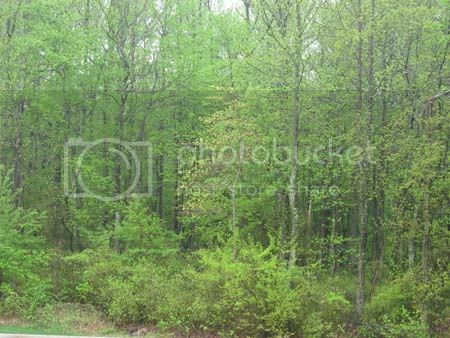 Who said "Going Green" would be easy ? Green is back in my neighborhood though and so is Spring. We used to be quiet afraid of Brown Rice when we first heard about it. We even made fun of it and like ignorant bumpkins made statement that rice which was available for free in Indian ration stores were packaged and sold in super market aisles here at a high price. Truth be told we had tried neither, the ration rice or the brown rice. But like true browns we chased the white until we fell for the goodness of brown. With great trepidation we tried our first brown rice and liked nothing much about it. The only way we could eat this stuff is as a Khichuri or a Fried Rice, proclaimed the other half. So that is how it was, Brown Rice Khichuri or Fried Rice occasionally, on days we felt our body should ingest some goodness. Eating it felt morally so good that we could chomp on a burger later without any guilt. Slowly we ventured into making regular brown rice, flavoring the cooking liquid with cardamon, cloves and what not. We got hooked onto the nutty taste, it tasted best with a gravy thing or with dal. We even graduated to having fish curry with Brown Rice. Yes, we have come a long way on the Brown Rice Trail. We still continue having white rice though and haven't switched completely but weekends are always brown and so are most of the one pot rice meals. 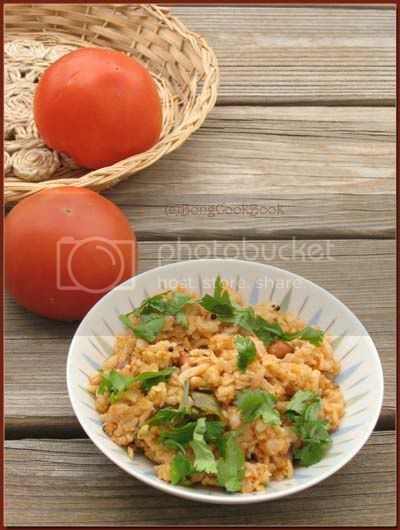 Some weekends back D made a Tomato Rice. He used Brown Rice instead of the white rice that is normally used. 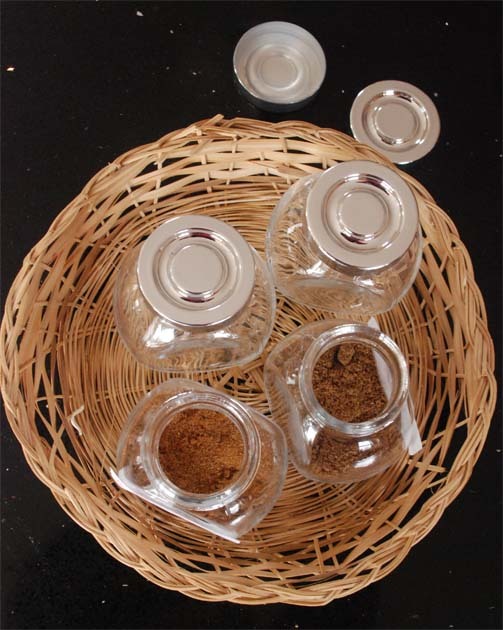 He followed Sailaja's Recipe down to making the spice powder. It tasted beautiful. Next day I made some to pack for lunch. I skipped the spice powder as I wanted a non-South Indian Tomato Rice. Instead I added some fresh home made Garam masala powder. That tasted great too. And we had one more Brown Rice recipe that worked great for us. 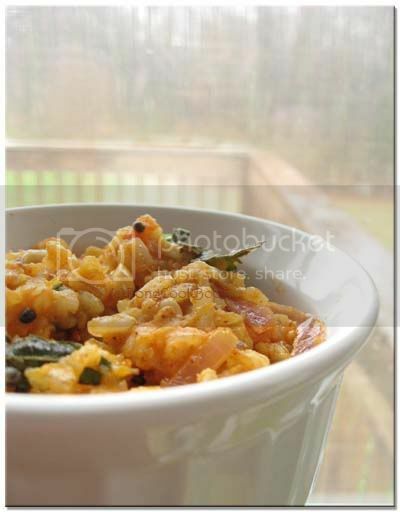 Are you afraid to try Indian dishes with Brown Rice, give it a try, you just might love it.